The rare fossils of Thrinaxodon liorhinus, a distant extinct relative of living mammals, have played a central role in understanding both early mammalian evolution and the theory of plate tectonics. Thrinaxodon lived during the early Triassic (240-245 million years ago) and was roughly the size of a house cat. Only about two dozen reasonably complete and well-preserved specimens are known, most of which were discovered in South Africa and reside in museums in Cape Town, Bloemfontein, and Johannesburg. Thrinaxodon is a basal member of Cynodontia, a lineage that includes mammals and their closest extinct relatives. Thrinaxodon preserves a combination of primitive and derived characters, showing an early stage in the evolution of the characteristics that distinguish modern mammals from other living species. Illustrations and a more detailed explanation of the place of Thrinaxodon in early mammalian history are available in an excerpt from Thrinaxodon: Digital Atlas of the Skull. The discovery of Thrinaxodon in Antarctica during the 1960's by Edwin Colbert was a stunning revelation to the scientific community- how could this terrestrial animal have made it from South Africa to Antarctica without a land connection between the two? Geophysicists have subsequently amassed a tremendous amount of data that indicates that Antarctica and Africa were connected during the Triassic. This specimen of Thrinaxodon was the first used to test the effectiveness of high-resolution X-ray CT scanning for imaging paleontological specimens. It was collected by Charles Camp in South Africa in 1948 for the University of California Museum of Paleontology, Berkeley (UCMP 40466). The specimen was scanned by Scientific Measurement Systems, Inc. in 1992 in the horizontal plane for a total of 153 slices, each slice 0.2 mm thick, with an interslice spacing of 0.2 mm. See the inspeCTor for unreduced CT data. The entire dataset was mastered onto CD-ROM and published in 1993 for DOS (Rowe et al., 1993) and later for Windows (Rowe et al., 1995). Estes, R. 1961. Cranial anatomy of the cynodont reptile Thrinaxodon liorhinus. Bulletin of the Museum of Comparative Zoology 125:165-180. Fourie, S. 1974. The cranial morphology of Thrinaxodon liorhinus. Annals of the South African Museum 65:337-400. Olson, E. C. 1944. The origin of mammals, based upon the cranial morphology of therapsid suborders. Special Papers of the Geological Society of America 55:1-136. Parrington, F. R. 1946. On the cranial anatomy of cynodonts. Proceedings of the Zoological Society 116:181-197. Rowe, T. 1993. Phylogenetic systematics and the early history of mammals; pp. 129-145 in F. S. Szalay, M. J. Novacek, and M. C. McKenna (eds. ), Mammalian Phylogeny: Mesozoic Differentiation, Multituberculates, Monotremes, Early Therians, and Marsupials. Springer-Verlag, New York. Rowe, T. 1996. Brain heterochrony and evolution of the mammalian middle ear; pp. 71-96 in M. Ghiselin and G. Pinna (eds. ), New Perspectives on the History of Life. California Academy of Sciences Memoir 20. Rowe, T., W. Carlson, and W. Bottorff. 1993. Thrinaxodon: Digital Atlas of the Skull. CD-ROM (First edition, for MS-DOS platform), University of Texas Press, 623 megabytes. Rowe, T., J. Kappelman, W. D. Carlson, R. A. Ketcham, and C. Denison. 1997. High-resolution computed tomography: a breakthrough technology for earth scientists. Geotimes 42:23-27. Horizontal slice movies through homologous points showing differences between Monodelphis domestica (left) and Thrinaxodon liorhinus (right). Click on thumbnail to view movie. 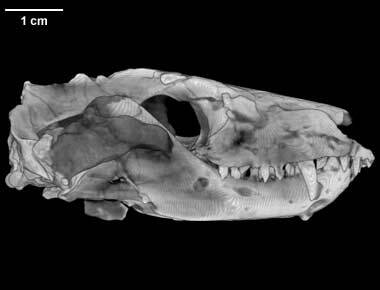 To cite this page: Dr. Timothy Rowe, 2001, "Thrinaxodon liorhinus" (On-line), Digital Morphology. Accessed April 19, 2019 at http://digimorph.org/specimens/Thrinaxodon_liorhinus/.